French captain of marine, Fabien Burignot de Varenne has imagined the Sphyrna 70, a 20 meters long asymmetric multihull drone. With his company, Seaproven, he wants to demonstrate that navigating drones can be useful for ports surveys, security or oceanographic studies. 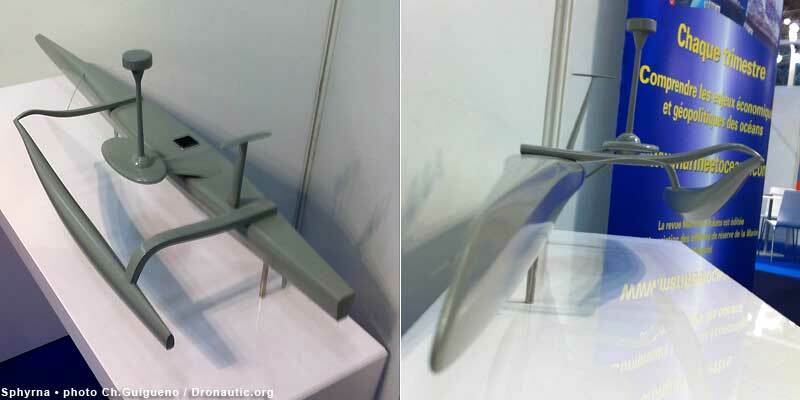 Met during the Marine pro show, the Euronaval 2014, Fabien Burignot de Varenne explained he had already test his ideas on a 65 meters long trimaran. The Sphyrna 70 is a new prototype actually built in shipyard based in Normandy. This drone looks like a proa but it is better a trimaran with only one float. “She is 20 meters long,” said her designer. “She is dismountable in three parts to be able to enter in a container”. Her motor is a diesel one “which works three hours a day to feed the electric motor who propel the boat”. This hybrid motorboat should be able to navigate few months and Fabien Burignot de Varenne wishes to make her cross the Atlantic in 2015. If she is too big and as she uses a diesel motor to be a Dronautic’6, the Sphyrna is an interesting kind of Dronautic, which could be the first navigating drone to be able to cross the Atlantic.